Smooth Jazz New York in association with Marquee Concerts is presenting another star-studded contemporary jazz line up for New York City’s original Smooth Cruise series, now in its 19th year. The 2016 summer season takes place aboard the Hornblower Infinity, a 210-foot luxury yacht. The cruises set sail Wednesday evenings, July 13 through August 31. The summer’s roster includes seven nights featuring more than a dozen of the world’s most popular contemporary jazz and R&B acts in an intimate setting. 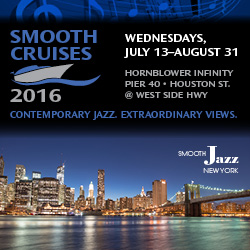 With shows at 6:30pm and 9:30pm, the Smooth Cruises depart promptly from Pier 40, located at Houston Street at the West Side Highway and cruise down the Hudson River, offering world-class artists as well as exceptional views of the Statue of Liberty, the Freedom Tower, and the New York City skyline. The spacious Hornblower Infinity features an open bow, covered sky deck and over-sized windows that provide endless opportunities to enjoy sights of New York Harbor as guests enjoy the music of world-renowned artists. The yacht features spacious exterior sun decks and also includes climate controlled interior decks with multiple dance floors, enabling the cruises to sail rain or shine.